Where is the "loose check" option? I'm looking for the "loose check" option. Do I need a paid account to access this option? I have a free account and can't seem to find this preferences window anywhere. In addition, the thread is older so maybe it is no longer an available preference. All the features are available even for free accounts. Due to changes, you may now apply the checks by following the sequence below. Setup & Embed > Preferences > Advanced Settings > Unique Submission. Thank you for giving JotForm a try and we hope it suits your needs. 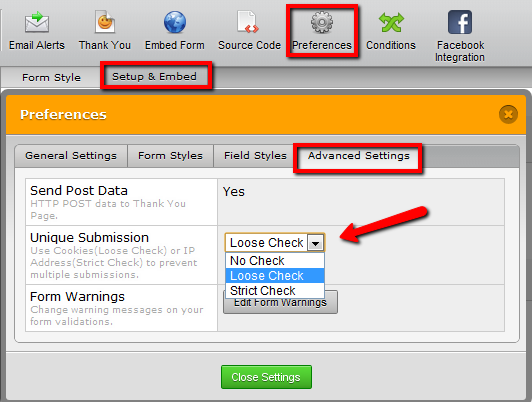 To find the "loose check" option, go to Setup & Embed > Preferences > Advanced Settings and then modify the option for "Unique Submissions". Hope you find this information useful. Please inform us if you need further assistance with regards to anything JotForm-related. Two support guys at once. Preciate it fellas! This works great!